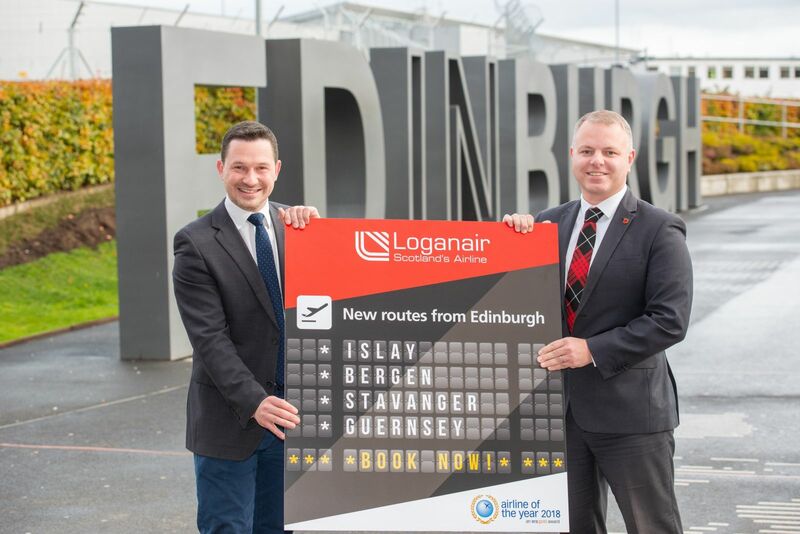 Loganair has announced its largest expansion programme at Edinburgh Airport, with four new routes being launched as part of its summer 2019 schedule. The airline will introduce year-round services to the Norwegian cities of Bergen and Stavanger; to the island of Islay; and a seasonal link between Edinburgh and Guernsey. Stavanger will become Loganair’s second destination in Norway with four flights each week from Edinburgh, on Mondays, Wednesdays, Fridays and Sundays. Flights from Edinburgh to Bergen – the Gateway to the Fjords – will operate three times a week on Tuesday, Thursday and Saturday. Bergen, Stavanger and Guernsey will each be operated by the airline’s newly acquired 37-seat Embraer 135 jet, the latest addition to its fleet of 30 aircraft. A 34-seat Saab 340 will fly the Edinburgh to Islay route – the capital city’s first ever scheduled air link to the Inner Hebrides. The service will begin on March 25 and will initially operate four times a week before building up to a daily service by May, with a morning flight on Saturdays and lunchtime services on the other six days. It will offer new links from Edinburgh to the ‘Queen of the Hebrides’, which is experiencing significant growth in tourism and business following the opening of new hotels and growth in the golfing and spirits distillery sectors. Loganair also plans to increase the frequency of flights between Edinburgh and the Isle of Man, adding an extra service on Wednesdays throughout the summer, plus a Saturday flight during the iconic TT race weeks in May and June. There will also be an improved schedule to and from the Isle of Man on Fridays and Sundays, with evening flights for weekend breaks and those commuting for work. The new service from Edinburgh to Guernsey will operate on Saturdays from May 11 to September 14. “It marks the first phase of our Summer 2019 schedule announcements, and we expect to make more in the coming months across our network.